Other Observers: Chris Wood. ; Rich Miller found this species during the fall of 2006. I finally saw the bird(s) in spring of 2007.
along the bluff trail, along the Canon City Riverwalk. 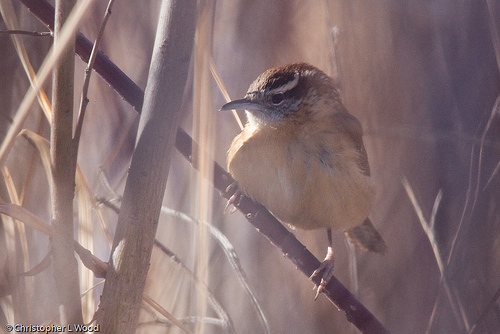 A large wren, with rufous upper parts, white eye line, buffy under parts. See photo. Behaviors: Bird was with other birds, along the Canon City Riverwalk, staying low. Seen some in Colorado, and many in the eastern U.S. Comments: This was the first record for the Penrose CBC and I'm not if the species has been documented before in Fremont County. Independent Observers: Rich Miller found this species during the fall of 2006. I finally saw the bird(s) in spring of 2007.